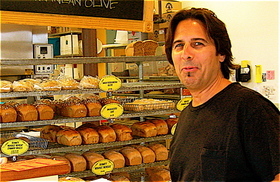 Got wind the other day - from a Montpeculiar business lobbyist, as a matter of fact - that 620 WVMT-AM morning radio jock Charlie Papillo, of "Charlie & Ernie" fame, was whining on the radio airwaves about the fact I'd snapped his picture at the Great Harvest Bread Store on Pine Street, but never published it in this blog. Charlie, so sorry. The opportunity simply hasn't presented itself. Haven't been tuning in. 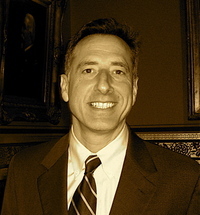 But with the Vermont Legislature back in session and you having guests like Senate President pro tem Peter Shumlin, I tuned in this morning. So here's the shot of your handsome self at long last! Mr. Papillo leans to the political right. And he challenged Shummy about his support for Rep. Mike Fisher's bill declaring that President George "WMD" Bush's authority to federalize the Vermont National Guard for Iraq duty has terminated. "The Governor’s already come out and said that any bill that would suggest that, he would veto it in a minute. You’re going to continue on that fight?" asked Charlie. Shumlin: I have really strong feelings about the war in Iraq. I also think it’s a great example of why Americans are turned off by politics-as-usual. All these folks running around saying we’ve got to get out of Iraq, we’ve got to end this war. Nothing happens. And the fact is the Vermont Guard has made the most extraordinary sacrifice for their country and they are fighting hard in Iraq and I think Adjutant General Dubie has done an extraordinary job. I am proud of the families and the Vermont Guard. 1. That the government of Iraq was a threat to the United States. Well guess what? Saddam Hussein is not longer a threat to the United States. 2. We had to get those weapons of mass destruction. Well, haven’t found them yet [because they do not exist]. 3. That it was punishment, in effect, for their complicity in 9-11, which we know also didn’t happen. So either Congress needs to authorize a new resolution saying we’re gonna mediate a civil war in Iraq, or we should bring our Vermont Guard members home.